On Monday, June 17, Erik Ellestad brings his acclaimed Savoy Cocktail Book Night to Los Angeles for the first time, as part of the Guest Bartender Series at Eveleigh. Savoy Cocktail Book Night usually takes place on the last Sunday of the month at the The Alembic Bar in San Francisco. During these special events, Ellestad and the Alembic’s bar team make any and all cocktails from the Savoy Cocktail Book. Anticipation for Ellestad’s guest night is already running high amongst LA’s cocktail cognoscenti. Ellestad is currently Unix Systems Administrator for the University of California, San Francisco and bartends 2-3 nights a week at Heaven’s Dog. 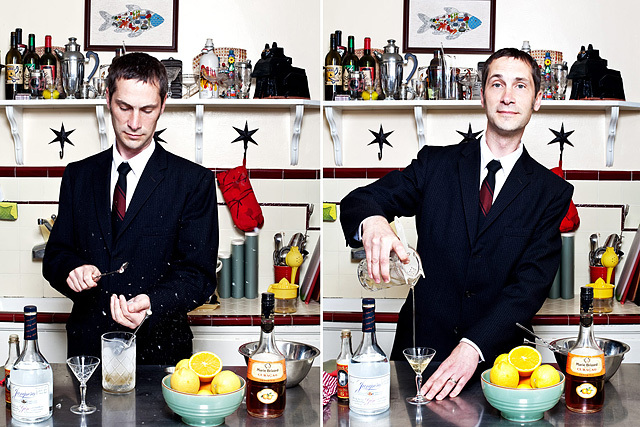 He’s garnered considerable respect and acclaim from the global cocktail community for making all 750 cocktails in the Savoy Cocktail Book. Ellestad documented that remarkable journey in his blog, Savoy Stomp, an invaluable resource for anyone with even a casual interest in cocktails. After the jump, Ellestad shares some insights into the Savoy Cocktail Book project, as well as a recipe for one of the six gin cocktails he’s featuring at the Eveleigh on the 17th. What inspired you to embark on the Savoy Cocktail Book project? At the time, I was a host on the eGullet.org forums and looking for some way to increase my understanding of classic cocktails, along with increased interest and participation in our Cocktail and Spirits forum. As those goals go, it was certainly a success. Enough of a success, that I launched the blog based on the popularity of the discussion thread. Why the Savoy as opposed to other classic cocktail books? First, I wanted to understand the recipes, ingredients, and formulation of classic cocktails, so I discarded modern books and modern takes on classic cocktails. I wanted to go directly to the source material. Then I looked through the books I had at the time and assessed how many of the ingredients seemed familiar and/or commercially available. The Final Three that remained were Jerry Thomas‘ Bartenders Guide; Charles Baker, Jr.‘s The Gentleman’s Companion; and the Savoy Cocktail Book. Jerry Thomas is the Ur-cocktail book, but seemed like too much work as regards to home-made ingredients. Charles Baker, Jr. is an awesome writer, but it seemed like it would be too much work to parse the recipes and/or massage them into something drinkable. Finally, the Savoy Cocktail Book‘s art was a big plus. The Art Deco-style illustrations of Gilbert Rumbold are just awesome. You made all 750 recipes, how long did that take? Any cocktails/ingredients in particular that really posed a challenge? I started the project on eGullet in June of 2006. I finished the cocktails proper, with some breaks and time off, posting the Zed cocktail to Savoy Stomp in April of 2011. I finished most of the other drink categories with the Absinthe Frappe a year later in April of 2012. I still have to figure out a strategy for the Punch and Cup sections of the book. As regards to ingredients, remember, I started the project in 2006. Absinthe was still thought to be illegal and Haus Alpenz had yet to launch its line of vintage ingredient inspired Spirits and Liqueurs. I made everything from Swedish Punch to Plum Gin to Hercules. Any favorite cocktails and/or any that you would be happy never to make again? I’m always interested in new flavors and interesting combinations. My favorites are often those which fall outside of the simplified canon of modern cocktails. I am especially fond of things with a large proportion of Vermouth or other aperitif wines. I would be perfectly happy to never make another Pousse Cafe, (layered, liqueur based cocktail). How did it expand from your blog to Savoy Cocktail Book Nights at The Alembic? The Alembic opened in 2005 and had the added bonus of being fairly close to my day job at the time. With its fine selection of beers and whiskies, it soon became one of my favorite watering holes. Daniel Hyatt and Josey Packard launched the Savoy Cocktail Book Nights there as a sort of performance art bartending event. When Josey left for the East Coast (Drink in Boston), the Savoy Cocktail Book Nights fell by the wayside. One day I was in the bar and asked Daniel what had happened to the Savoy Cocktail Book Nights, and he suggested that we re-launch them together. We’ve been doing them at The Alembic now since November of 2008. Squeeze orange peel over glass and discard. 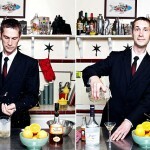 Photo by Gabriela Hasbun for Imbibe Magazine, via Facebook.